This Sunday is Conner's first Halloween and I am so freaking excited. 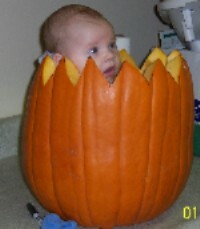 He is going to be a little pumpkin. I can stand how cute he is. We went to Hubers this past Tuesday and got Conner his first pumpkins.